But will #OscarsSoWhite help or hurt ratings? Between the #OscarsSoWhite controversy, Leonardo DiCaprio's relentless marketing push for an Oscar and what host Chris Rock has to say about all of it, Sunday's Oscars ratings are even harder to predict than usual. But no matter what happens, ABC's telecast will likely be the most-watched entertainment program of the year, again. While Super Bowl ratings have steadily risen over the years, Oscars ratings have fluctuated wildly over the past two decades from as few as 32 million total viewers in 2008 to more than 55 million in 1998. But even during its down years, the telecast has consistently drawn one of the year's biggest TV audiences. The 2015 ceremony, which was watched by 37.3 million total viewers, was the lowest-rated Oscars telecast since 2011 but still ranked as the No. 4 most-watched program and the No. 1 entertainment program of 2015. Only a trio of NFL telecasts—the Super Bowl, the Super Bowl postgame show and the AFC Championship Game—had larger audiences last year. That's why the Academy Awards are still an all-star destination for advertisers. The average cost of a 30-second ad during Sunday's Oscars telecast is between $1.9 million and $2 million, according to Kantar Media. That's up from the $1.8 million average for last year's telecast, which Kantar said generated $110 million in ad revenue. Those numbers are significantly larger than the average cost of a spot during last year's Grammys ($942,000) or Golden Globes ($577,000). The highest-rated Oscars telecast of all time (at least since 1973, as far back as Nielsen's data goes) was the 1998 ceremony when Titanic, which had just become the No. 1 film of all time, won 11 Academy Awards, including best picture. And 2010's big number, 41.7 million, came during a year in which Avatar, which had also just become the No. 1 movie, was up for for nine awards—including best picture, which it lost to The Hurt Locker. Similarly, there was a big ratings bump in 2004, when The Lord of the Rings: The Return of the King, that year's top-grossing film, won best picture. The academy used to routinely nominate the year's biggest movies for best picture—including Star Wars, E.T. the Extra-Terrestrial, Jaws, Raiders of the Lost Ark, Rain Man, Forrest Gump and The Godfather—but that's no longer the case. The low-rated 2008 broadcast featured the following films battling for best picture: No Country for Old Men (the winner), Atonement, Juno, Michael Clayton and There Will Be Blood. The highest-grossing movie of the bunch, Juno, was only the 15th most popular film that year. Even the acting awards were devoid of big stars, with Oscars going to Daniel Day-Lewis, Marion Cotillard, Javier Bardem and Tilda Swinton. That could spell bad news for this year's ceremony; most of the year's biggest films were shut out of the major categories, including Star Wars: The Force Awakens (which has five nominations, mostly in technical categories) and Jurassic World (which failed to garner a single nomination). The wild card of this year's telecast, however, is the #OscarsSoWhite firestorm, with black stars like Will Smith and Spike Lee boycotting the ceremony after actors of color were shut out of all the acting categories for a second straight year. The controversy could prompt audiences to stay away in solidarity or generate greater interest than usual with potential viewers who want to see how host Chris Rock—who pulled out of all his Oscars publicity commitments shortly after the controversy broke—will address #OscarsSoWhite in his monologue and during the show. ABC said that no advertisers have dropped out of the show as a result of the controversy. But even if a larger audience tunes in for Rock's monologue, viewers could flip away long before Revenant, Mad Max: Fury Road or The Big Short walks away with the best picture Oscar some three hours later. 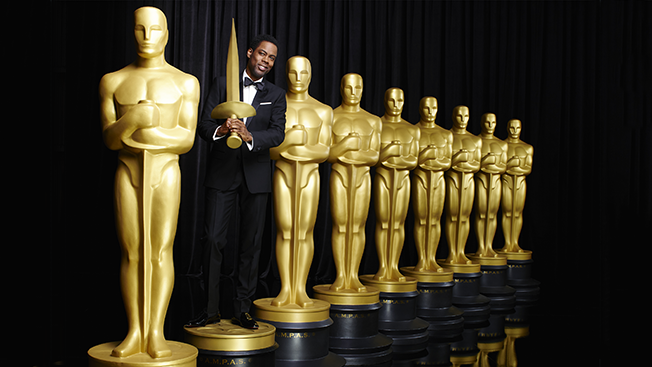 It won't be the first time Rock will be addressing the paucity of black nominees at the Oscars. When he first hosted the show in 2005, he aired a video of his trip to a nearby Magic Johnson Theater where he couldn't find a single black person who had seen any of the movies nominated that year for best picture.